This paper presents a fast numerical solver for a nonlinear constrained optimization problem, arising from 3D concentrated frictional shift and rolling contact problems with dry Coulomb friction. The solver combines an active set strategy with a nonlinear conjugate gradient method. One novelty is to consider the tractions of each slip element in a polar coordinate system, using azimuth angles as variables instead of conventional traction variables. The new variables are scaled by the diagonal of the underlying Jacobian. The fast Fourier transform (FFT) technique accelerates all matrix–vector products encountered, exploiting the matrix’ Toeplitz structure. 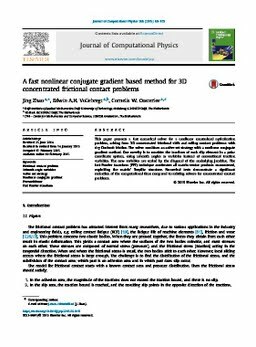 Numerical tests demonstrate a significant reduction of the computational time compared to existing solvers for concentrated contact problems.